Ross County striker Declan McManus wants to lay down a marker for the new season by inflicting an early-season blow on Dundee United in the Betfred Cup. The Staggies lead Group A after beating Elgin City on Saturday and can open up a five-point lead on the Tangerines, who lost on penalties at home to Arbroath, if they beat Csaba Laszlo’s side in Dingwall tomorrow. McManus, who scored the opening goal in Saturday’s win against Elgin, said: “Before a ball was kicked everyone would have expected us and Dundee United to be battling it out win the group, so for them to slip up shows how tough this is. “They’ll be different here on Tuesday and we can’t take too much notice of their result and take them lightly as it is a different task and we will have to be at the peak of our powers. County were dominant from the first whistle to the last but had to wait until the hour mark to make the breakthrough thanks to some resolute defending from Elgin. The home side’s perseverance finally paid off on the hour mark when captain Marcus Fraser drove into the box before finding McManus and the striker was able to convert the defender’s cross past Kyle Gourlay from close range. Elgin pushed men forward in the hope of finding an equaliser but it was County who got the crucial second goal of the game as substitute Josh Mullin fired past Gourlay from the edge of the penalty. Davis Keillor-Dunn struck the post in injury time as County pushed for a third but Elgin held out to ensure there was no further scoring. Elgin manager Gavin Price was pleased with his side’s showing against County but is concerned at possibly losing defender Stephen Bronsky, who suffered an injury in the closing stages. He said: “We frustrated them. We had a few breaks with goalkeeper saves and missed chances. For only having been back two or three weeks it was a reasonable showing from us, defensively keeping shape and frustrating Ross County. “We’ve played two or three teams from the lower league and this was a big jump up, two leagues above us and a team just down from the Premiership. We’ve not by any means disgraced ourselves. It is another step forward in our preparation for when the league starts. “I’m hoping it isn’t serious because Stephen is an important player and we’ve already lost Craig Beattie from that position at centre half for a few weeks. 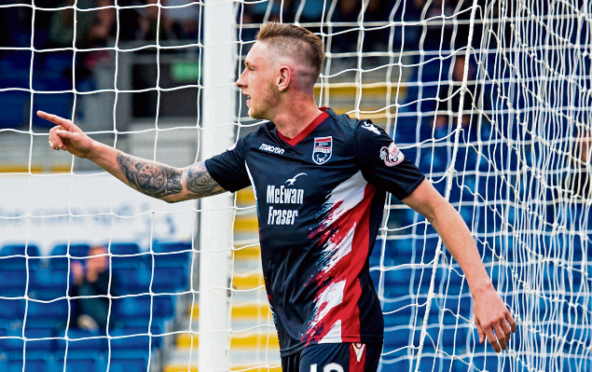 Ross County – Fox 5, Fraser 6, Kelly 6, Fontaine 6, Morris 6, Draper 6, Gardyne 7 (Mullin 74), Lindsay 6, McManus 6, Dow 6 (Mckay 70), Dingwall 6 (Keillor-Dunn 83). Subs not used – Munro, Watson, Dykes, Keillor-Dunn, Paton. Elgin City – Gourlay 7, Cooper 6, Lowdon 6, McHardy 6, Bronsky 5, McGovern 6, Banjo 5 (Taylor 88), Miller 5, McLeish 6 (Hay 74), Sutherland 5, Byrne (Farquhar 62) 5. Subs not used – Ross, Wilson, Ballam, McDade. Referee – Alan Newlands 6.